This is my TOP 10, and this time it is entirely dedicated to online games. Each person has his own opinion on this matter. 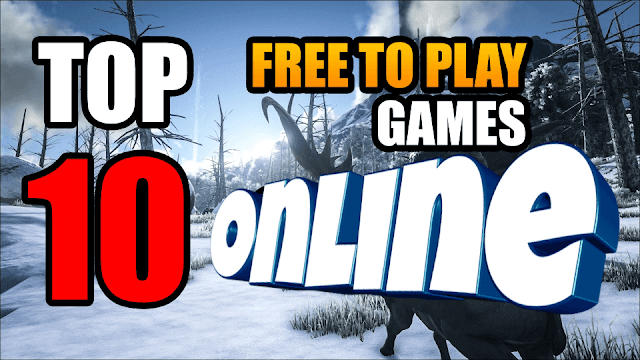 In this post I bring the top 10 best online games on the PC, which made the biggest impression on me. The second part of one of the most popular games in the genre of mob quickly broke into the world of geymdev, generating a lot of clones. The first Dot was cut using the level editor for the first Warcraft and subsequently improved. The second Dot was announced in 2010, and officially released as early as July 2013! The game has two teams of five people, one of which plays for the light side, the other for the dark side. The meaning is to pump the character and destroy the base of the other team. In parallel, you can kill rivals and mobs. As they say, all ingenious is simple. Unlike the first DotA, you can not only participate in battles, but simply watch them as a spectator. Well, the main advantage of DotA is that it is an official cybersport discipline. Online game, which, according to the Guinness Book of Records, is more popular than any other, certainly became a milestone in the history of gaming, but nowadays the project is steadily moving towards its decline. Fantasy World of Warcraft has about 8 million players who play the principle of "pay that play" - that is, paying for each month spent in the game. The fans of the game claim that the interesting thing about WoW is that there you can not only fight against mobs and other people and pump out a character, but also engage in various things like fishing and gathering herbs, for which you can pump non-combat professions. There is also a system of achievements, various pets, mounts. In general, these days no one is surprised, but WoW is the MMORPG standard. Once immersed in this world, there is the opportunity to lose reality and stay in it for a long time. Since the release of the game, it has been more than 10 years. The picture is pretty outdated, despite the fact that the game looks different from the one that was originally. Blizzard keeps the players not so much with the capabilities and technical level of their project, which, to put it bluntly, is outdated, how much a feeling of nostalgia, in which it is so nice to immerse experienced players. However, in our time the prospects for the game are hazy. Most likely, in the coming years we will witness the death of the legendary MMORPG under the steady pressure of new, much more serious and modern competitors. Raid, instance, party PvP - this is a collective matter, but if you do not unite for them, then we can safely say that Neverwinter Online is quite an RPG solo. The game is excellent and surpasses the same Warcraft in many categories. Of course, there are not so many races and classes here, but given the novelty of this MMORPG, you can say that this business is acquired. Well, in terms of graphics and combat system, she leaves the legendary cow milking Blizzard far behind. This is a completely different level of implementation, much more modern. Well, the decisive word in favor of this game can be considered its free. Yes, Neverwinter Online is a game in which everyone can play without hindrance, without paying a dime, despite the fact that its graphics and technical level fully correspond to the paid project. Another great game, whoever said anything, quite deserving of its place in the TOP of the best online games. The smartest graphics and just a giant world, through which you can move both on your own and on the car, while crushing obsessive zombies. The only significant drawback of the game is that it needs to be bought, although, compared to other paid online games, it is a mere penny. In addition, you pay only once, getting a lifetime subscription, which can not be said about the notorious Warcraft , where you will be dragged out of money until you get bored. In general, if the topic of the zombie apocalypse is interesting to you, welcome! Another such MMORPG you just will not find. Robbing, killing and stealing cars - now you can do it not only alone. The transfer of the legendary simulator of bandit life online was logical and inevitable. It remained only to wait for this event, and it has come! In GTA Online there is an opportunity to make up gangs, go through missions with friends, organize robberies. You create yourself a character, making his family tree. In online, your money can go to the pocket of the player who killed you, but it is possible to assign a reward for the killer's head, which makes the game much more interesting than usual. However, in comparison with the single version, the game has a much worse graphics and a lot of technical disadvantages, dropping it from the podium. One of those shooters who do not need a presentation. About this game, heard almost everything. But why does it only take the 5th place? The fact is that although the game itself positions itself as free, it is pretty much decided by Donat. Otherwise, at the initial levels to play this game will have to die once for 100 per fight. However, if you do not feel sorry for your time, you can get free of charge. In the rest of the game it's hard to find fault with something. The developers very well tried to make one of the best online games in terms of graphics, and the gameplay here is very exciting. In general, if you do not mind a hundred or two rubles for a good armor and gun, you definitely will like the game! In fourth place we have the legendary WoT. The harsh, uncompromising World of Tanks spares no one, whether you are 10 or 40 years old. The peculiarity of the game, I think, is that both old and young are equally fond of playing it. In Belarus they managed to create a truly popular game, in which millions of gamers play. Especially loved by our compatriots. In the game, as in any conditionally free project, there is a donut. I can not say that it really hinders, but many players are humiliated by the fact that much of the technology is available only for real money. Tanks liked me for being unobtrusive enough. The fighting lasts about 15 minutes, and at any time you can leave them with impunity, which is incredibly convenient for those who have too harsh mother or wife. But over time, the game began to become boring. The biggest disadvantage of this game can be called too slow dynamics. Tanks travel slowly, and besides constantly have to hide behind hills and other shelters, which further stretches the process, resulting in the game becomes boring. By this, in my TOP best online games World of Tanks take only 4 place. The next MMO game is for those who definitely spend their time wisely. And yes, this is another example of the fact that domestic developers know how to make good game projects. Penzar can be attributed to the genre of MMOFPS or action-RPG. In the game there is no open world yet, since the idea and fundamental factor of Pansar is the spirit of modern online battles.and the team game. There is completely no such thing as one in the field warrior. In total, there are 4 races in the game: humans, orcs, elves and gnomes. The main action takes place on combat maps - from miniature glades, where players fight for the capture of the point, to complex multi-stage and widely spaced arenas and castles, in which not for long and get lost. The rules of the game depend on the type of card. On some, they are elementary - the key zone gives points to the team that owns it. In others, there are several capture points, one team storms them one by one, and the other defends. There is a "king of the mountain" in which the first to capture the point is fixed on it and beats off attacks from the hill. There is an ordinary team battle wall to wall. For each fight, experience and gold are charged, the ratio of which can be changed. In addition, for battles players get resources to create armor and healing potions. Pansar itself is a rare project that boasts excellent graphics, because it's on the CryEngine 3 engine . You can tell about visualization - everything is fine. The game is free, and speaking of the donat, we can say that a compromise is reached - if you pay, then you pump faster, if you do not pay - the character develops more slowly. However, in this genre it is even profitable not to rush - plus is that learning the game process and training skills is more consistent than for donat. This online shooter impressed me and immediately caught my dynamic and unusual style. No other online shooter did not give me such pleasure in terms of killing mobs. Send them to the next world can be hundreds of different ways - from the most sadistic like chopping to pieces, to relatively neutral - like an electric shock. What is there just is not - and some semblance of magic, and a bunch of trunks that can be easily upgraded, and blades with which you can not just kill opponents, and do it with sophisticated tricks. Opponents, by the way, are also different here - from mercenaries to certain zombie-like identities. Gameplay Warframe is built entirely on the co-op, and it is on this depends the successful performance of missions. Therefore, if you have a couple of friends, download - you will not regret. Cheerful evenings are guaranteed to you. The game is available to everyone completely free of charge, despite the fact that its graphics and capabilities fully correspond to the paid project. Believe me, this is much more interesting than all possible "Warfyles" and "Counter Strike . " Without thinking a second, I give this masterpiece the first place. Why him? As is known, in the war an important role is played not only by aviation. That's why in Var Thunder there is a variety of ground equipment, as well as a fleet is planned! But in War Thunder I like not so much this, how much, the attention and care that developers give to the player. After all, the game has a whole bunch of battle modes: historical, realistic, dynamic. The first - for lovers of historical conformity and historical companies. The second - for fans of the most realistic battles with all the physical nuances - here without the presence of certain skills and experience you can not normally manage the technique. Well, the last mode is the most trashy one. Still it is called arcade - here and control is simpler, and it looks all as exciting. What is noteworthy, this game is the starting FREE TO PLAY project even for the PlayStation 4. The game, which definitely stands its first place. Donat in it does not solve anything. The main thing is that you are required to have direct hands.